Dental Bridges - Oxnard Family Dentists Carson & Carson, DDS. 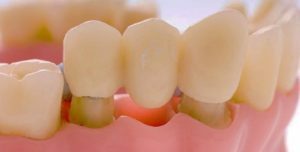 A dental bridge is a fake tooth cemented into a gap attached to and held into place by a crown or implant on each side of the gap. This treatment is often used to restore the aesthetic and function of missing or lost teeth. 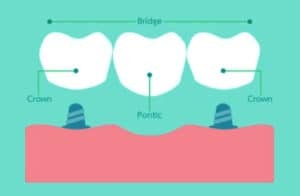 A bridge is similar to dentures or dental implants in that they replace missing teeth, however, where dentures can be placed and removed in the mouth, a dental bridge or implant is a permanent prosthetic that can only be placed or removed by a dentist. Unlike dentures, implants and bridges offer a more comfortable experience that is much closer to having natural teeth. A fixed bridge or implant is also useful for preventing the degradation of bone in the face and jaw. 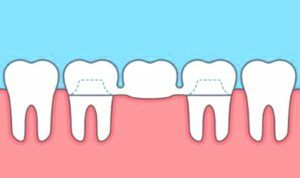 During the dental bridge procedure, dental crowns are placed on the teeth (called “abutments”) surrounding the gap in order to act as anchors for the replacement tooth (called the “pontic”). This structure is cemented over the gap and leaves a natural, clean look in your mouth. With proper, daily care for your oral hygiene, a dental bridge can easily last over a decade. If you feel that you may be a good candidate for a dental bridge procedure, then we encourage you to give us a call at Carson& Carson, DDS 805-983-0717 and speak with one of our dental experts. Our Oxnard office is available 24/7 for emergency dental treatment and provides many individuals with affordable dental services. We accept many forms of dental insurance at both of our state of the art offices. Visit the Oxnard dentist with over 45 years of experience working with Dental Bridges and Dental Crowns – Carson & Carson, DDS. The dental bridge procedure is typically a multi visit process. The first visit usually involves just the preparation of the surrounding teeth. We will get the abutment teeth ready for the bridge by removing a part of the enamel, then a mold of the local surroundings can be taken. From this mold, the replacement tooth and crowns can be created within the same day. We will install a temporary bridge for you to wear while you wait for the permanent bridge to be made. The purpose of the temporary bridge will be to protect the area from infection and bacteria and should only be used for a few days. During the second visit, we will remove the temporary bridge, and then check that the new bridge fits the area and is a comfortable fit. We will make any modifications to the permanent bridge to make sure that the fit is snug. The permanent bridge can then be placed and cemented into your mouth. A third visit may be recommended as a checkup to make sure that the bridge is comfortable and has set well. Beyond this, further adjustments are usually not necessary for years. This woman is a success story by any measure. This dental work was a result of an accident earlier in life where her teeth were knocked out. She had worn a removable partial for over ten years. I made a fixed half arch bridge. She owns her own retail parts business. A lost out of town person came into her business for directions; after receiving directions, he complemented how beautiful her teeth were. This lost dentist paid me the highest complement possible. She replied,” thank you but they are not mine, they were made by Doctor Carson. ” I wish I could have been there to catch his surprise. Check out more of our dental bridge case studies here. At Carson & Carson, we want to help you look your best. A dental bridge can give your mouth a more natural look and restore the function of missing teeth. Take a look at some of our case studies below. If you would like to know more about getting a dental bridge, or are in need of dental work, then call us today and setup an appointment. You can reach our Oxnard office at 805-983-0717. Carson & Carson, DDS is one of the most experienced dental offices in all of Ventura County with over 45 years of serving patients affordable dental care.